The free iPhone word game 4 Pics 1 Word is pretty damn popular. So popular that an app that allows players to cheat in the game debuts this week at number six on the free iPhone game charts. Sheesh. Mobile gaming is a wild and unruly frontier. 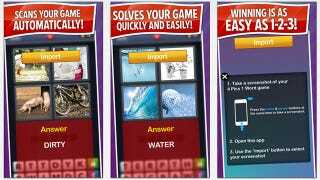 One week you're the game that copied that other game and became more popular, the next there's a program from Cheat Master and Friends Word Cheats, LLC. on the charts, undermining your carefully-crafted free-to-pay structure by offering unlimited cheats as a $1.99 in-app purchase. But hey, nice to see Major Magnet get a little chart loving, and a big shout-out to Impossible Pixel for living up to its name as the only game on the free charts that costs a dollar.